We all agree that reading is a mighty good thing for our children- it improves their vocabulary, it builds new cognition, it grows their imagination, it teaches them about life, and it lets them travel vicariously to faraway places. However, if reading does not come easy to your youngster, don’ t worry : keep reading and soon you will see that practice makes perfect. Young readers’ reading success stems from consistent practice and enjoyable reading experiences. To welcome Spring and to give your new reader a positive and fun reading experience this spring, the Roosevelt Branch Library offers a New Readers Book Club, “Hop into Reading, with Spring Book Buddies”. This program is designed to strengthen new readers’ reading skills and to introduce them to the joy of reading, by paring new readers with teen volunteers in a fun read-aloud sessions. This reading club welcomes kindergardeners, first, second graders and their parents every Saturday in April and May, drop-in times: 2pm-4pm. Every child will get to record their reading leaps into a “Frog Log”. Hop into Spring with Roosevelt Branch’ s reading club! For the younger ones (infant to 3 year-old) the Roosevelt branch offers the phenomenal story time, “Mother Goose on the Loose ” on Saturdays (April 6, 13, 20, 27) or Thursdays (April 4, 11, 18, 25), 10:30 am – 11:30 am. Registration required. Preschoolers and caregivers, enjoy some playing, reading, and singing at the “Book Party! for Preschoolers”. Fridays(April 5, 12, 19, 26), 10:30-11:15am. New at Roosevelt Branch: On April 20 and April 27 , 2-4pm, for those families who want to celebrate and explore Award-winning literature by Latino authors, come and joint the “Nuestros Libros Para Todos” Dia Family Book Club. To register for this programs, stop by the the Children’s Desk at the Roosevelt Branch or call (312) 746-5656. Enjoy the wealth of programs at Roosevelt Branch Library! It’s story time at Roosevelt Branch Library! Several years ago my then two- year old daughter would start reciting “One, two, Buckle my shoe; Three four, Shut the door; Five six…” every time we put on shoes and we head outside. Looking back, it was amazing to hear my two-year old counting till ten, rhyming words and memorizing short poems. How did I do it? I brought her weekly to the “Toddlers & Two’s” story time at Roosevelt Branch library. “Mother Goose on the Loose”. Meets Tuesdays. Tue. February 19, and 26, March 5 at 10:30am, at the Roosevelt Library Branch (1101 W. Taylor Street). Ages 0-5 years old. To register for this story time session you can stop by the Children’s Desk or call (312) 746-5656. “Mother Goose on the Loose”. Meets Saturdays. February 9, and 16, 23 at 10:30am, at the Roosevelt Library Branch (1101 W. Taylor Street). Registration required. Book Play! For Infants &Young Toddlers, Thursdays, February 14, 21, 28 at 10:30, at Roosevelt branch library. Ages 0-18months. Children will enjoy the animated reading time and after the program parents &children are welcome to stay for some play time. NEW at the Roosevelt Branch: Book Party! for Preschoolers, Fridays, Feb.8, 15, 22 at 10:30 am. Utilizing the” It’s Every Child Ready to Read “approach, parents will learn how to “nurture” pre-reading and reading skills at home and children will enjoy the carefully selected stories. Very often my weekends are spent bringing my children to various kids’ activities around town and last- minute weekend shopping. Does that sound familiar? How about you decide to spend your weekend right here in our neighborhood?! No traffic jam, no long cashier lines, no crowds. Go to the Park! It is officially winter, yet these days we get spoiled by 40 degrees temperatures, that are ideal for play at the park. Why not? Bundle up your kids with scarves, mittens and hats and visit the nearby park. If we are really lucky to get snow, then your park visit might be even more magical. Sledding down the Garibaldi Park hills, building snowmen, making snow angels and playing snowball fight is what my kids love to do on a snowy day at the park. Meet your neighbors. Schedule a play date for your children and your neighbors’ children. Add a twist to your play date- invite your neighbors’ kids and bake cookies, make a winter or Valentine’s Day craft, etc. Explore Taylor Street cafés. My children love to dine at Sweet Maple Café and Stax. Recently, I treated my children to a cupcake at “Flirty Cupcakes” on Taylor, where they each ate a cupcake named “Curious George”. 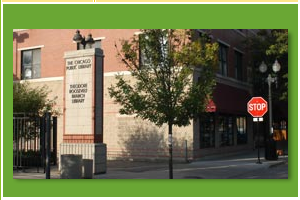 Visit the Roosevelt Branch Library: there you can find a book for everyone in your family. From science, comics, board books to poems, the book selection in the kid’s department (2nd floor) can accommodate book interest of infants to 18 years-olds. Have fun right here -in your neighborhood! Maria Gueret contributes to the Kids Activities/Library blog at C4C. She grew up in picturesque Bulgaria. Later, she married in Switzerland where she lived for four years. When she and her family moved from Europe to the USA, Chicago seemed the best choice of cities in which to settle down. Maria finds Chicago not only cosmopolitan, but multicultural enough to satisfy her passion for diversity and culture. She fell in love with the Little Italy neighborhood because of its European touch and the possibility to get anything within walking distance- Conte di Savoia’s groceries, Starbucks coffee, Italian ice, library books, kid’s ballet classes at Hubbard Street Dance Studio, etc. She is mother of two busy children, whom often you can see at the Garibaldi Park or on their bikes strolling through the neighborhood. She graduated from UIC with B. S. in Accountancy and speaks Bulgarian, Russian, German, and some French. In the last three years she has been active as a volunteer at her children’s school, where she chairs a committee linked to cultural events and exposure to world languages. Have you visited yet the National Museum of Mexican Art in Plsen? Located at 1852 West 19th Street, this museum is just a short bike ride for most of us who live in this community. Scanning its website, I was easily persuaded to visit the museum, given that the museum events satisfy perfectly my two passions: kid’s art activities and culture. This month the museum offers plenty of engaging and culturally stimulating activities for children. The workshop, Family Sunday: Angel Ornaments with Guest Artist Patricia Carlos Dominguez, caught my eye. It takes place on Sunday, December 16th, 12-2pm, $2 fee per person, with prior registration required (Call to register 312-433-3908). Right after the workshop , the museum holds FREE Family Christmas Concert with Miguel de León (Concierto Familiar Navideño con Miguel de León), Sunday, December 16th, 2-3 pm. Earlier in December, the Children’s Workshop: Holiday Ornaments(Taller para niños: Adornos Navideños) is another workshop I can add to my kids to-do list. When: Saturday, December 8th, 10am-1pm, $5 per child, Registration: 312-433-3908. For those of you who want to learn more about the wonders of this place, the museum offers FREE Public Tours, Saturdays, December 15, 12pm English, 1pm Español. Through the year there are attention-grabbing, Children& Family Programs, like Saturday Children’s Art Classes, After-school Art, Family Sundays and more. For more info, click here to visit the National Museum of Mexican Art website. “It takes a village to raise a child” says an African proverb. After I had my two children, I truly embraced this expression, but now I can add something to it: I hope this village has a library, too. Yes, a library. Take the Roosevelt Branch Library on Taylor Street. Eight years ago as a new mom of an one year old I started visiting the library’s story times for infants, and ever since my two children and I are devotees of the Roosevelt Branch Library on Taylor Street. The phenomenal story times that the Roosevelt Branch Library offers are special, because they are targeted to the very little ones and they work wonders on the child’s early literacy skills. At these story times you will not see babies chewing on a board book, but Ms. Jenna, the very talented children librarian who enhances the children literacy skills by reading animatedly picture books, singing nursery rhymes, clapping, and inviting everyone to participate. Presently, I share the credit for the superb reading skills of my two bilingual children with the Roosevelt Branch Library. If you have a little one (0-5year-old) now is the time to register for the December session of the story times. ” Mother Goose on the Loose” meets three Tuesdays in December, 10:30 am – 11:00 am at the Roosevelt Library Branch (1101 W. Taylor Street). To register call (312) 746-5656. If you can commit to only one Tuesday, and you want to make new friends and engage in creative play with your little ones (0-18 months), you should register for the “Book Play! for Infants & Young Toddlers”, Thu. December 13, 2012, 10:30 am – 11:15 am. Another one- time fun event at the library is “Criss-Cross Applesauce! Multi-Age Book Sharing”, Thu. November 29, 2012, 10:30 am – 11:00 am. This engaging story time criss-crosses and meets the developmental literacy need’s of infants, toddlers and preschoolers and it is a must-visit. What if you have children that are older and that have outgrown the rhyming story times? In December the Roosevelt Branch offers “Programs for Friends and Families” that target elementary school age children. “Awesome Afternoon: Craft Challenge!” Wed. December 05, 2012, 4:00 pm – 5:00 pm ( Ages 6 and up) will inspire your child to create his/hers craft masterpiece. At “Family Trivia Night”, Mon. December 10, 2012, : 6:00 pm – 7:30 pm, (Ages-5 years & up with adult). Your family can show off their knowledge and be rewarded by a fun experience (A small snack and drink will be provided). For 8 year-olds and up Smarty Pants, the Library gives one more chance to show off your brilliance: “Awesome Afternoon: Smarty Pants Trivia!”, Wed. December 12, 2012, 4:00 pm – 5:00 pm. (This is a drop-in program, so no registration is required) . Lastly, another way to engage your school-age child in critical thinking and peer socializing is with the “Awesome Afternoon: Board Games”, Wed. December 19, 2012, 4:00 pm – 5:00 pm, 8 years & up, (No registration required). Check out all these fun events at the Roosevelt Library Website. Experience the joy of reading and being read to-register for the fun kids reading events at the Roosevelt Branch Library!